With 9 billion people expected on the planet by 2030, there's a lot of work to be done. We'll need more housing, roads and utilities, not to mention more food for the extra tables. Topcon is driven to help you meet these demands with innovative solutions that help you work smarter and faster to create sustainable infrastructure and agriculture. Our mission is simple - to help grow your business. Sure, that helps us grow ours, and together we can help ensure that a growing world is a healthy world. That’s the Topcon vision and why more than 2,000 employees worldwide are dedicated to creating the technologies and bringing you the solutions to drive your success. From our scientists in our state-of-the-art research labs to our solutions developers dedicated to understanding the challenges you face, we're focused on helping your business grow in efficiency and strength. GNSS signals often reflect or fracture as they strike buildings, trees or other nearby objects. This results in confused signals called multipath errors. Topcon patented Fence Antenna technology, found in all our mobile GNSS antennas, to filter out this multipath error, resulting in high accuracy positioning even in the difficult conditions. Topcon pioneered the integration of imaging into traditional total stations over a decade ago, so it’s no surprise to now find it in many of our instruments and sensors, allowing users to not only measure, but to actually capture reality. With Topcon total stations, controllers, scanners or mobile mapping — what you see IS what you get. Topcon has combined the productivity of GNSS positioning with its unique zone laser transmitter to create a versatile, high-precision system that can control multiple machines at once. Millimeter GPS uses the laser-generated data to tighten vertical accuracy to a few millimeters — ideal for tight tolerance work such as highway construction and paving. The patented Universal Tracking Channels from Topcon are the industry’s only truly scalable technology that tracks any of the available GNSS signal on any available channel. Other technology requires each channel to be tuned to a single frequency, greatly limiting your ability to use every reliable signal. Topcon Universal Tracking ensures the best accuracy no matter where you’re working. Speed and accuracy are the two maxims for any measurement system. Topcon robotic total stations employ Matrix Detection, to automatically locate all prisms within a specified area, eliminating any need for manual guidance, no matter how tight the prism array. The fusion of GNSS positioning with inertial measurement technology was a breakthrough in 3-D machine control. Capable of measuring very fine movement, as well as pitch, roll and yaw, inertial sensing uses predictive algorithms to generate high-accuracy control to increase grading speed and precision. Our goal is to understand your business as well as you do. Every product we create is developed with your specific needs in mind. All products must pass Topcon's rigorous testing before they're launched. We field-, dust- and storm-proof every unit. We understand you want to be up and running fast. That's why each Topcon product is designed for use right out of the box. We know you have no time for downtime. Topcon tools keep going and going even in the most challenging of settings. 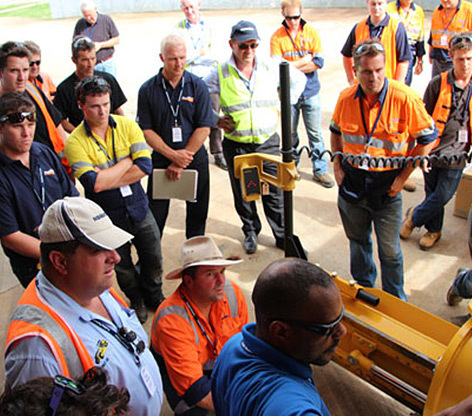 Topcon tools work with any machinery - you're not locked in to any vendor, even for positioning tools. Topcon products are configurable and based on open source platforms so you can tailor them to your exact needs. Topcon products are engineered for accuracy. So you'll get it right the first time - every time. Topcon wants to help today's students. Let’s face it, the world’s to-do list will likely continue to grow. Our solutions are only tools to help meet those needs. Education is the lifeblood of creating new solutions and efficiently using them. That's why our Educational Partnership Program helps provide colleges, universities and technical institutions with access to and training on our latest products so they can deliver state-of-the-art education in precision positioning solutions and technologies. Scholarships through Topcon corporate social responsibilities programs.